How do you recognise what is making that noise in the ceiling? Take notice of when do you hear the noise. Possums will only be heard at dusk and dawn, if they are living in your roof or ceiling, you will hear them when leaving at dusk, and then again when they return at dawn. Rats and mice are active at all times of the day and night, specially at night, when you may hear them fight, running back and fourth. It is quite amazing just how much noise such fairly small creatures can make. Possums will take up residence in ceilings only because their habitat is being lost at an alarming rate. New housing estates spring up fast, where one moment possums had their homes, now stands houses, where are they to go. There may be trees left standing in the new estate, but possums are territorial, and another possum may already be in residence, and they DO NOT share accommodation. You may not be living in a new estate, but you suddenly have a possum living in your ceiling. This may occur as someone close by may have cut down an old tree, the home of the particular possum, it had no choice but to move. What can you do to discourage the possum. First provide a home for the animal.This can be easily done by making or purchasing a possum box. Locate the new home close by in a suitable tree, remember they will need shade, as a box heats up fast in the sun.In the old days possums were relocated, this has however proved extremely unsuccessful, as possums are territorial and do not tolerate competition for shelter or food. In most instances the relocated possum will not survive. As we encroach on the habitat of native Australian animals such as possums, it must also be our responsibility to make sure these animals have a place amongst us, let them live their lives as undisturbed as possible, by providing them with a new home close by. Native animals in ceiling spaces are a matter of building maintenance rather than wildlife volunteer removals. There are two reasons why WIRES volunteers will not go into ceiling spaces for such situations, whether snakes, possums or other. 1. If we were to remove the animal, what is to stop it, or another returning/setting up residence? 2. Our insurance doesn’t cover us to do this. It is essential to determine how the animal is accessing the ceiling space and then make a one way catflap type arrangement so the animal can exit but not re-enter. This might mean installing a sturdy strip screen of for example aviary wire (1cm sq) around the periphery of the roof line apart from a metre or two where the temporary animalflap is installed. The flap can be as simple as a strip of shadecloth taped at the top with gaffa/masking tape, preferably at known point of access. Then, once the animal has departed, close the gap with aviary wire. Quite a few dwellings in the Northern Rivers are older style with many access points and irregular roofing & guttering edges so when we explain all of this to owners/tenants/agents they resign themselves to co-existence with their resident native animal. Pythons will often take up residence in the ceiling and are a free non -toxic rodent control. They are non-venomous and do not chew electrical wiring. People will, of course, need to house their chooks, aviary birds, rabbits and guinea pigs in python proof enclosures (aviary wire). However children, dogs and cats are faster than pythons, so should not be at risk. 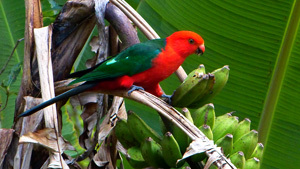 Co-existing with wildlife is part of the pleasure of living in the Northern Rivers. If there is some aspect of this particular situation which is not covered by the above, please do not hesitate to call us on our 24 hr wildlife rescue hotline 66281898. Relocations usually go wrong if not done right, Possums MUST be provided with a home. Clicking here will show you the result of a relocation done without giving the possum a home. Please be advised graphic image is disturbing.